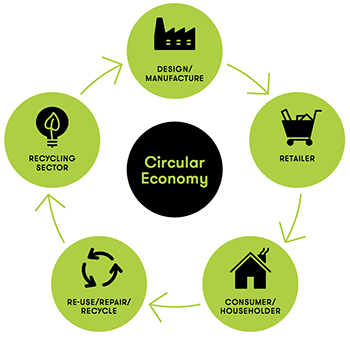 A Circular Economy is an alternative to the wasteful traditional ‘linear’ economy based on ‘take, make, use and dispose’. It's a self-sustaining system driven by renewable energy with an imperative to keep material resources in use, or ‘circulating’ for as long as possible. It extracts the maximum value from these resources while in use, then recovers and regenerates products and materials. A truly Circular Economy is driven by renewable flows, rather than finite stocks. It depends on renewable energy sources, including wind, solar and bioenergy, rather than coal and other fossil fuels and materials from renewable sources.